The rich and educated are more likely to marry, to marry each other, and to produce rich and educated children. But this virtual cycle turns vicious for the poor. The familiar story about income inequality and the lost middle class often starts with bots and boxes. Technology and automation (often summed up as "robots") have destroyed routine-based middle-class jobs, widening the gap between the rich and poor. Globalization (i.e. : international trade, symbolized by the container box) has eliminated a swath of well-paid work, like manufacturing. But forget about technology and trade for a moment. There is a more human story to tell about middle class woes. It's a story about marriage. Imagine the Typical American Family: Married, living together, with at least one kid under 18. That family earned a median income of $81,000 last year, as Ben Casselman showed with new Census data. That's a fine income, and it's growing, if slowly, even after you adjust for inflation. But look closer at where all the money's come from in the last few decades. It's not the husband. It's coming from the wife. 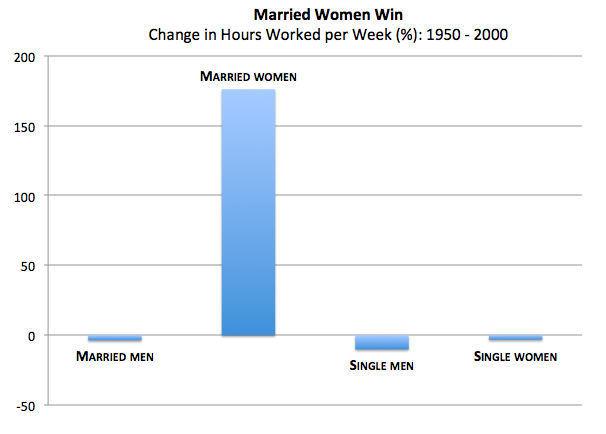 Marriage used to be a pairing of opposites: Men would work for pay and women would work at home. But in the second half of the 20th century, women flooded the labor force, raising their participation rate from 32 percent, in 1950, to nearly 60 percent in the last decade. As women closed the education gap, the very nature of marriage has changed. It has slowly become an arrangement pairing similarly rich and educated people. Ambitious workaholics used to seek partners who were happy to take care of the house. Today, they're more likely to seek another ambitious workaholic. The good news here is that women have the degrees, the means, and the freedom to work when they want to. 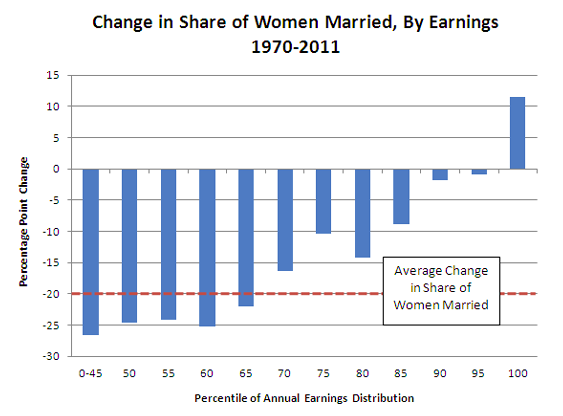 The bad news is that the Typical American Family has only seen rising incomes in the last half century because of working wives. In America today, a healthy, growing family income is a two-person job. Just look what happens otherwise. 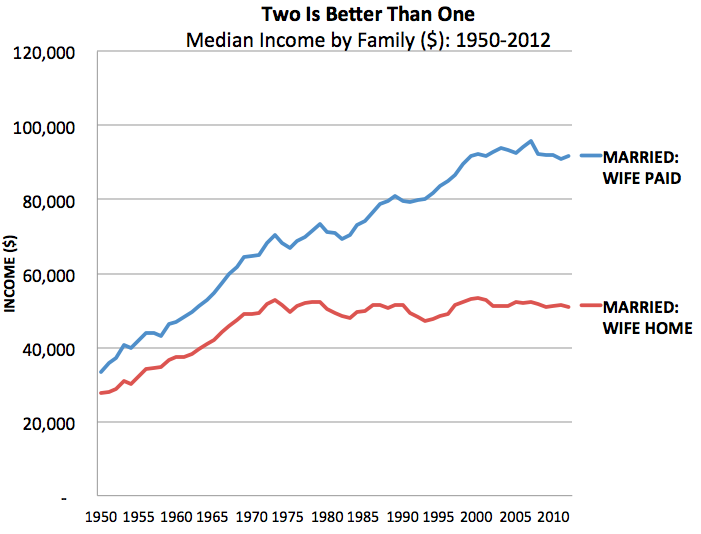 The typical family with a stay-at-home wife/mom has seen incomes grow only 1 percent, after inflation, since 1980. But dual-earner households have seen a 29 percent raise, according to 2012 Census data. ... and this graph traces their descent. 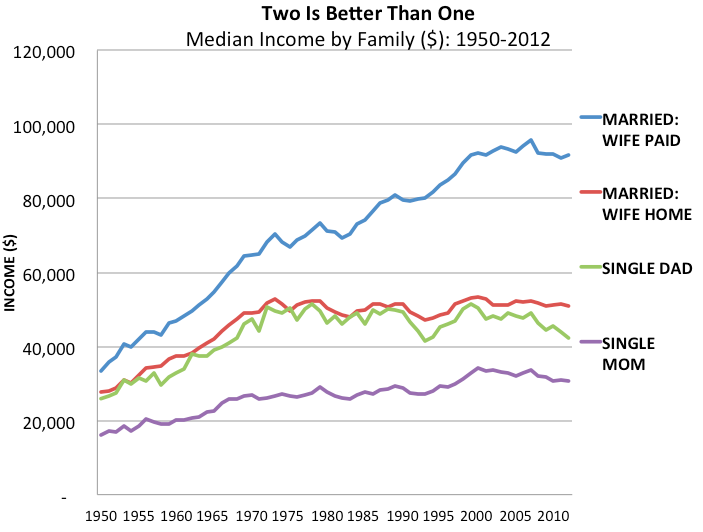 Median incomes among families led by single dads and single moms have flat-lined or worse in the last few decades, falling behind those of married couples, whether or not the wife is working. Single moms and single dads are more likely to be poor, not only because they don't have help in the household, but also because they didn't have much money to begin with. In a strange twist, marriage has recently become a capstone for the privileged class. The decline of marriage, to the extent that we're seeing it, is happening almost exclusively among the poor. The lowest-earning men and women (i.e. : the least-educated men and women) have seen the steepest declines in marriage rates, according to the Hamilton Project. 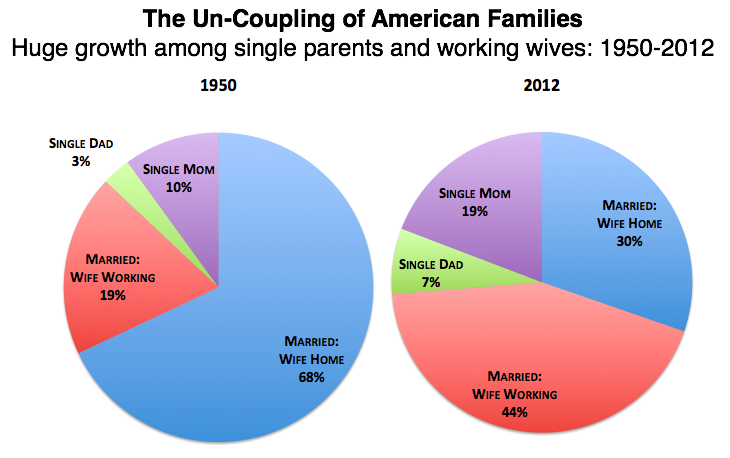 The single parent crisis is concentrated among minorities. Single mothers and fathers, a rarity among white Americans, are common among minorities. More than 50 percent of Hispanic babies--and an astonishing 72 percent of black babies--are born to unwed mothers, according to Family Facts. 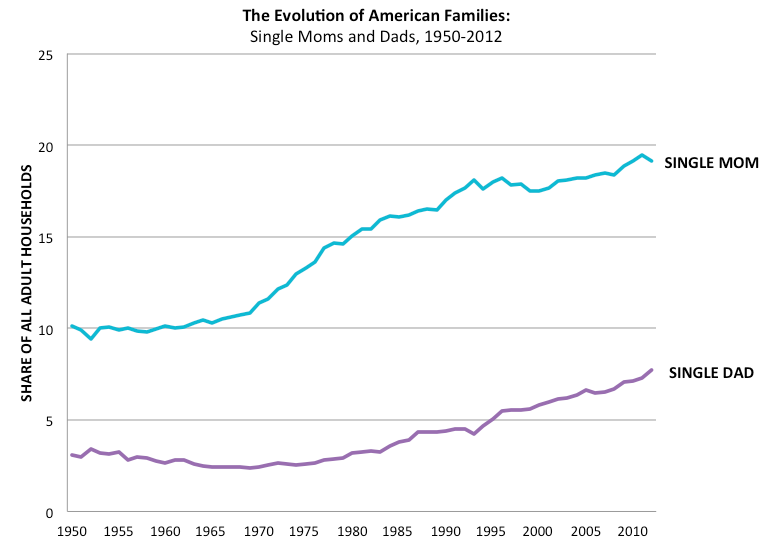 The causes of the single parent boom among minority populations is debatable. Sociologist William Julius Wilson pinned it on economics and crime, arguing that "high rates of [male] unemployment and incarceration meant that the local dating pool was populated by unmarriageable men." Another answer, from George A. Akerlof and Janet Yellen in a famous Brookings paper, suggested that abortion and contraception laws "[made] the birth of the child the physical choice of the mother [which made] marriage and child support a social choice of the father." If the causes are mysterious, the outcome is not. The decline in marriage rates among poorer men and women robs parents of supplemental income, of work-life balance, and of time to prepare a child for school. Single-parenthood and inter-generational poverty feed each other. 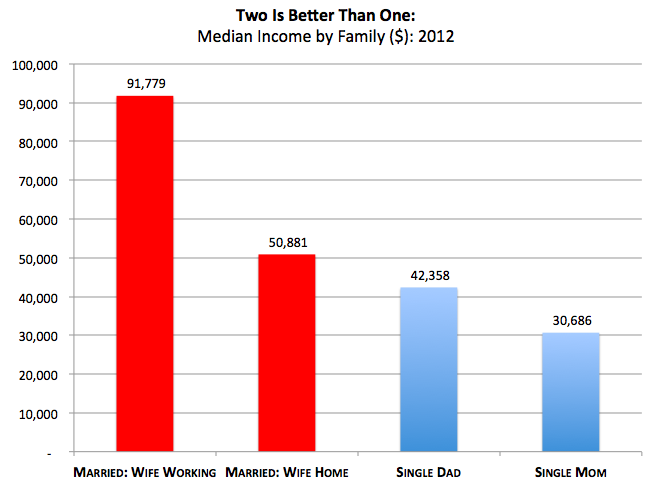 The marriage gap and the income gap amplify one another.